Hello, friends of Shelby Township and happy fall! As you can see, the air is feeling a bit crisper, night is creeping in a little bit earlier every day, and the leaves are evolving into their famous autumn hues that stuns the nation every single year. As a tree service here in Michigan, we’re especially in tune to what the fall brings to these magnificent plants. To commemorate our favorite season, and since it’s the worst time of year to prune trees, we thought we’d put forth some autumn inspired tree decoration ideas. String lights weaved through the branches are gorgeous during all seasons; but mixed with the sunset hues of the leaves, twinkling lights enveloped in the foliage resembles what could only be described as magic! Because winter and the holidays proceed autumn, it’s best to avoid making the trees look too winter wonderland. We recommend purchasing lights with warmer hues that will look absolutely stunning as the sun sets and the lights turn on. Autumn means Halloween, and we don’t like to forget about this favorite holiday! Trees are the perfect medium for expressing your love for the holiday, and turning them into a home for the biggest and scariest bugs around is a fantastic way to spookify your home. Go to your local supplies store’s Halloween section to pick up some stretchable spider web which looks like a cotton-polyester block. Stretch it out across the branches in your trees so that it looks as if Aragog has taken over your property. Top the tree with a faux-spider to complete the look. If you’re an arachnophobe and would rather not bring anything spider resembled onto your property, we understand. As a tree service, we’ve been spooked by a great deal of spiders. Another scary, Halloween inspired option is to go the bat route. Go to your local craft store and pick up some felt and use it to cut out bat-shaped images. Attach them to string and hang from branches. 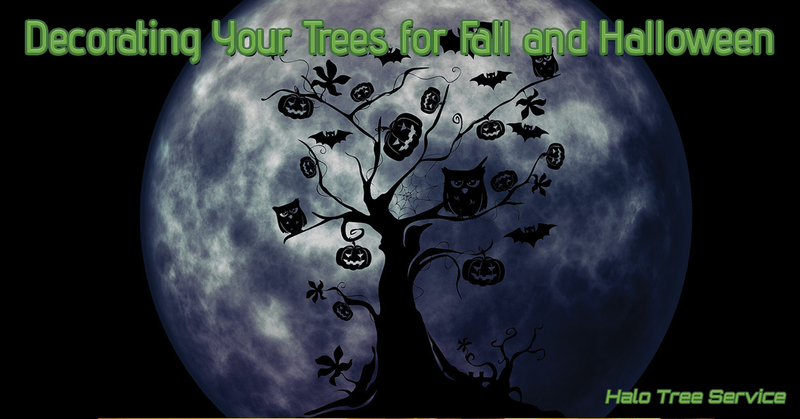 Your tree will look like a colony of bats overtook your trees, warding off trespassers! Sometimes, it’s the simple things that count! Nothing screams “it’s fall!” quite like pumpkins and jack-o-lanterns. The trees here in Michigan tend to decorate themselves just by the nature of them changing, and leaving the branches be is still just as lovely as decorating them. Our tree removal company loves the look of pumpkins and jack-o-lanterns placed beneath the trees. The orange hues of both the leaves and the pumpkin collaborate to produce a perfectly-fall aesthetic! While we urge people to avoid pruning and trimming trees in the fall due to the likelihood of them contracting a disease, we’re still available year round for tree help! We hope that you have a nice fall and that you enjoy the foliage all around. Give Halo Tree Service in Shelby Township a call for anything tree related! See you soon.